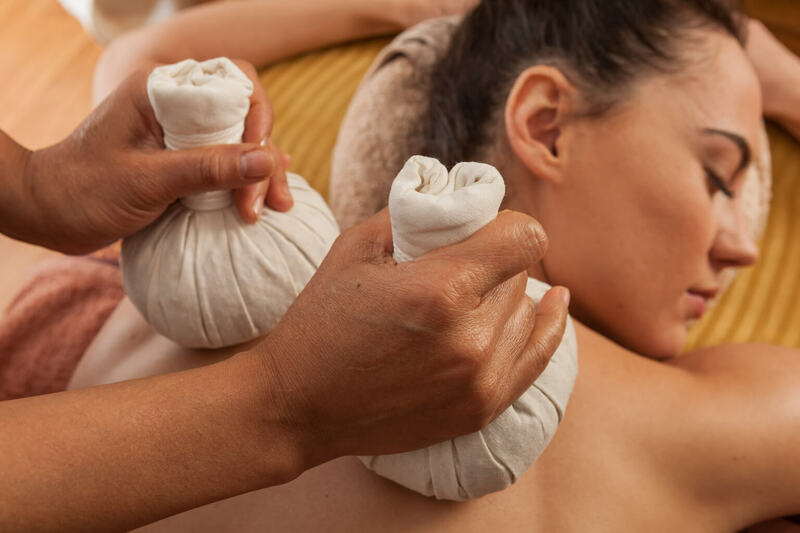 Thai herbal stamps massage is a special combination of aromatherapy, thermic therapy and acupressure. This unique, traditional art of therapeutics has been used in Thailand since a hundreds of years. In all ThaiSun salons You are able to experience firsthand typical thai solution for cold and tiredness. Hot herbal stamps full of aromatic herbs would help you conquer inflammations. This treatment is a priceless method for cold or infections. Thanks to compresses, which have high temperature, masseurs can easier massage and stretch tensed muscles. As a result, massage' d be less painful and more effective. By choosing herbal stamps massage you decide to follow experience of traditional thai therapy. It's excellent treatment for people who need to warm up, but also for those who want to experience aromatherapeutical effect of organic herbs. We recommend you to try this massage any time of the year. Indication for thai herbal stamps massages can be upper respiratory tract infections. Aromatherapy, especially eucalyptus and camphor, gently relieves blocked nose and reduces cough. All of this in combination with steam and warmth, would quickly help you to get rid of all of the ailments in the most pleasant way. Except of medical and warming up properties, thai stamps massages moisturize and rejuvenate skin. Steam from hot stamps is useful in reducing skin imperfections and cleaning pores from blackheads. First results are visible straight after treatment. After massage, it's recommended not to bath for a few hours in order to let the herbs work. 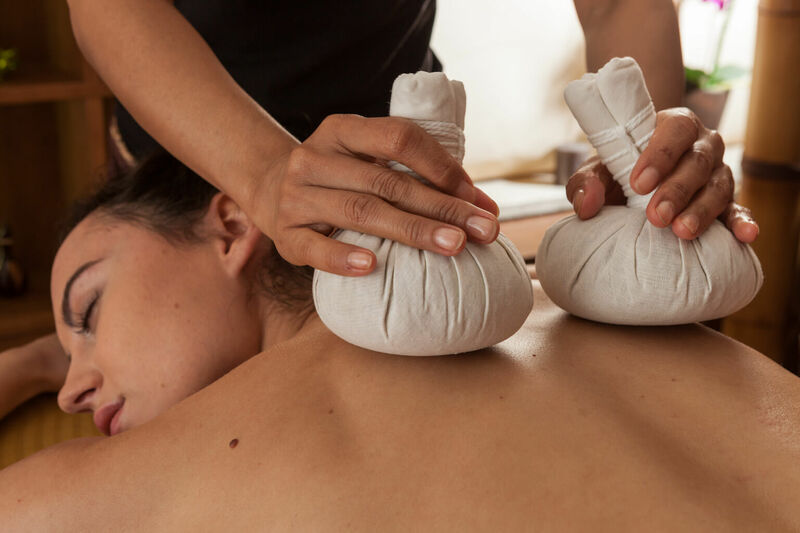 Traditional thai name of stamps using for massage is 'luk pra kob', which translated means 'herbal ball for squeezing' due to their spherical shape. Thanks to hot compress masseur can deeply concentrate on aching joints and tensed muscles. Herbal stamps are well-known in thai traditional medicine. Herbs inside compress have been used in Thailand since almost two thousands years. Their appearance is connected with buddhist monks from India and indigenous tribes from north Thailand. Due to the fact that making stamps has been easy and ingredients have been widely available, this massage has united different social groups. For instance in the past this kind of massage was used by king, warriors coming from the battlefield, but also by ordinary citizens. Raw materials forming herbal stamps are organic and it hasn't changed since a hundreds of years. It's the combination of herbs, fruits, spices and flower. Compresses consist of ginger, cinnamon, mint, sage, lemongrass, eucalyptus, camphor, kafir, lime, tamarind leaves and lavender. Thai herbal stamps massage is a dry one, without using oils. It's performed in special, hypoallergenic disposable underwear, which masseur' d give You before treatment. Massage encompasses whole body. Firstly, masseur prepares body to putting herbal compresses. Before that herbal stamps are heated with steam, so that it can release maximum power of herbs. Next masseur uses properly hot stamps to massage deeply your muscles. This activity is repeated many times in order to let herbal extract get into your body. During the whole aromatherapy treatment you should remember to breathe deeply to get maximum profit. Bathroom and clean towels are always waiting for you in our salons. You don't shouldn't worry about any preparations. The only thing you need is time to let our masseur take care of you. It's available in classic version (herbal stamps), but also as a coffee and cinnamon compresses. Whole body massage. First part of massage (around 45 minutes) is a modified version of classic thai massage. It' s performed in order to prepare your body to putting herbal stamps Herbal compresses are steam heated so that it can release aromatic oils. In the next part of the treatment, warm compresses are being applied to your back, hands and legs. This action is repeated many times so that extract from herbs can be better absorbed by your body. It's 'warm' massage. Herbal compresses purify the organism, relax body and mind. Moreover, it'd give you better immunity. In addition to mixture of herbs and oriental spices, there're also available coffee and cinnamon compresses. Coffee seems to be really popular in modern cosmetics, because it excellently improves concentration, reduces tiredness and works anti-aging by neutralizing free radicals. Coffee and cinnamon compresses help to loose weight and reduce cellulite. Whole body massage. First part of massage (around 45 minutes) is a modified version of classic thai massage. It' s performed in order to prepare your body to putting herbal stamps Herbal compresses are steam heated so that it can release aromatic oils. In the next part of the treatment, warm compresses are being applied to your back, hands and legs. This action is repeated many times so that extract from herbs can be better absorbed by your body. It's 'warm' massage. Herbal compresses purify the organism, relax body and mind. Moreover, it'd give you better immunity. In addition to mixture of herbs and oriental spices, there're also available coffee and cinnamon compresses. Coffee seems to be really popular in modern cosmetics, because it excellently improves concentration, reduces tiredness and works anti-aging by neutralizing free radicals. Coffee and cinnamon compresses help to loose weight and reduce cellulite.